Space is a mess, and the sad truth is, we made it that way. Most satellites that have been lofted into Earth orbit didn’t have a plan for retiring them, and those dead hulks, along with the various bits of jetsam in the form of shrouds, fairings, and at least one astronaut’s glove, are becoming a problem. A mission intended to clean up space junk would be fantastically expensive, but money isn’t the only problem. It turns out that it’s really hard to grab objects in space unless they were specifically designed to be grabbed. Suction cups won’t work in the vacuum of space, not everything up there is ferromagnetic, and mechanical grippers would have to deal with a huge variety of shapes, sizes, and textures. But now news comes from Stanford University of a dry adhesive based on the same principle a gecko uses to walk up a wall. Gecko feet have microscopic flaps that stick to surfaces because of Van der Waals forces. [Mark Cutkosky] and his team’s adhesive works similarly, adhering to surfaces only when applied in a certain direction. This is an advantage over traditional pressure-sensitive adhesives; the force needed to apply them would cause the object to float away in space. The Stanford grippers have been tested on the “vomit comet” and aboard the ISS. We can think of tons of terrestrial applications for this adhesive, including the obvious wall-walking robots. The Stanford team also lists landing pads for drones that would let then perch in odd locations, which we find intriguing. Need to get up to speed on more mundane adhesive? Check out our guide to sticky stuff for the shop. Thanks to [my wife] for the tip. Interesting, should help with a fair amount of materials recovery… could be used to make other things in space for otner experimentation. If the junk stays junk, then a controlled burn into the atmosphere can bring lost minerals back to the earth, assuming the burnt materials arnt whisked into space. Sounds like walking on walking to me, a mirrored robot, one upsidedown to the other so when it walks the other one walks foot to foot in sync to it? OK I know, you ment wall walking robot. Typo fixed. Thanks for picking that up. There was a hackaday article about an Aussie team working on a new job thruster that could potentially use space debris as fuel, using an orbiting furnace. Nueman space? Why so much work in trying to grab? couldn’t they just scoop earth mover style? it’s not just a simple ‘grab’, it’s more a ‘hold-on-without-pushing-it’ as most attempts to grab things results in a small amount of ‘bounce’ which, in zero-gravity, will result in the object moving off in a potentially unexpected direction. Think of catching a ball in the palm of your hand – if you’re slow, it can sometimes have bounced out before it has been grasped. If one was to attempt to ‘scoop’ it, if there was nothing to also contain it afterwards, the scoop would simply push the object away (earth-movers have gravity to keep the dirt inside the bucket). That’s not to say that there aren’t other ways to get rid of the junk but, given the speeds and the orbital mechanics, I suspect that holding the space junk (and then manoeuvring with it) is significantly easier than trying to ‘bounce’ against it to change its orbit into one where it will be safely disposed of, say by burning up on re-entry, given the time it would take to fully decay and the potential number of other objects on that path to destruction. Oh, so a kind of ‘bag-with-a-funnel’ type of thing? I can see that being better suited for the small items, which I thought would be more dangerous as they’re not actively tracked and harder to see until too late. Trying to scoop a whole satellite might might be a bit trickier, not least the requirement for a big bag! I guess that they’re going after the bigger items (before they become lots of smaller ones) in more of a tug-boat approach where they attach a small(er) remote thruster in order to nudge the item to a critical orbit/speed. As soon as the object hits the scoop, it would bounce off very fast. It’s basically an elastic collision, where the lighter object (debris) gets more velocity than the heavier one. One might be able to fill the scoop with some kind of foam that would deform to make it an inelastic collision. 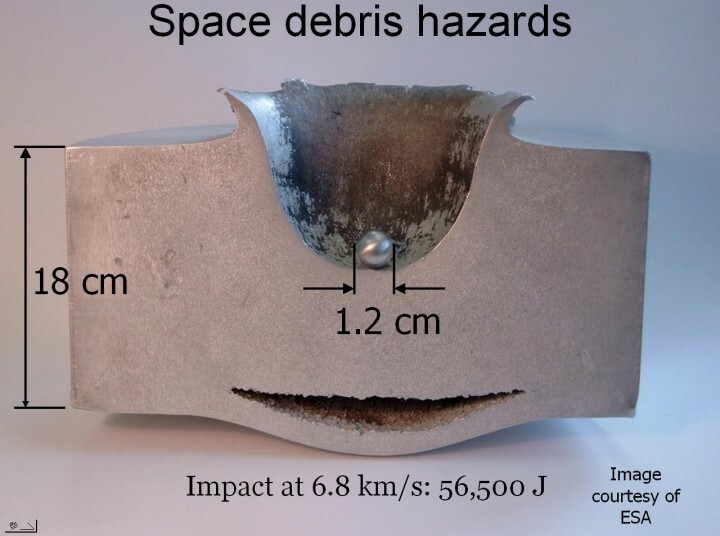 I think you grossly underestimate the velocity of most space debris. You could sync up trajectories and then capture items “gently” but this whole business of somehow capturing debris is completely impractical. You are not grabbing gentle space debris with some kind of gripper arm here. You are basically catching really, really fast “bullets” and other large things moving at bullet speed. In space. Please understand that a simple geostationary orbit is 6,935 mph at about 21,000 miles up. Low earth orbit speeds could be 15,000 mph or more. Bullets only travel at about 1,500 to 1,700 mph. This is five to ten times the speed with considerable more mass, moving with extremely different rotational forces, axis of symmetry and comprised of many different materials. This small sample was moving at roughly 15,000 mph when it impacted. Of course. That’s how you dock objects together and the same reason why when you are behind somebody on the freeway, you are both traveling at 65 miles per hour but appear to be nearly stationary relative to each other. The trouble is that these debris items are in vastly different orbits and aligning multiple orbits is very resource intensive to achieve, fuel wise. Particularly given the very small size and vast number of many of these objects. There is not a single path that discarded items take and the vectors are not binary in that they are forward and back and that’s it like you might see on a highway. You are correct that this sample is representative of a stationary item being struck by an item at full orbital velocity but the forces imparted onto items that are even slightly out of alignment can still be extremely significant. The bit everyone seems to overlook (well, I suspect the teams working on these problems don’t overlook) is that the velocities involved are huge. If you have two objects, like a piece of debris and a “net”, approaching each other head on, the combined velocity would be in the order of 10-20 km/s – somewhere between Mach 30 and Mach 60 if this were at sea level. Any attempt to grab, scoop, stick onto etc. at these speeds would be futile – just imagine designing a net on earth to capture something moving orders of magnitude quicker than a rifle bullet. Likewise, any attempt to match orbital velocities would require huge amounts of fuel. They just need a paddle that moves back and forth, bouncing the debris to stationary blocks in space, ???? They should use a vacumn, like in space balls. I think that the most efficient way to de-orbit space junk, is to fire a ground based laser and ablate the object on one side. The gecko method, would make more sense if you want to grab a non-serviceable satellite and service it. Laser ablation should work very well, if you know where the target is, and it isn’t prone to exploding. btw the re-entry point would be exactly on the opposite side of the planet from the laser (assuming you are starting with a circullar orbit and firing perpendicullarly to the surface), so that would have to be taken into account as well, as a lot of the bigger debris can make it through without completely burning up. As for funding – could be private as well – you pay and we clean up a spot that is perfect for your application. Also, protection from new junk, so your satellite doesn’t have to waste precious fuel evading it… Possibly even cleaning up after your lunch. Running the laser system would probably not be so expensive, so once the investment pays off, it should be nice cash-cow. p.s. USA being the one with the most spy and millitary communication satellites would suffer the most damage if this was used as a weapon, best leave it only for junk, so that others don’t have a very good reason to build one as well. But seriously, why not some cheap missiles to aim at the junk and slam it far out of orbit? That way it’ll only be a problem for our grand-grand-grandchildren. We have nuked space before. It didn’t clean up the space debris but did cause effects back on earth. How many missiles do you plan to launch exactly? There is a lot of space junk up there. Well I don’t plan. Leave that to the pros. I’m just a Pokémon. I think though this would be a cheap way to do it. Some rough guidance to put the missile on a collision course and done. Don’t even need to explode anything, just knock it hard. It meaning the roughly 17,852 to 170,000,000 pieces of items in orbit? And knocking things hard wouldn’t ensure anything would happen to destabilize it. It’s not as if up equals in orbit and down equals falls to earth and that’s it. So the better plan is catching all that? Lots of problems mentioned elsewhere in the comments with catching that stuff. Seems like it would cost much more and only be slightly more effective. Maybe one space robot could catch 10 more objects than a missile would and cost 500 times more to develop and launch? Of course we could just leave them all alone and risk a Kessler syndrome. By the way I had in mind knocking it out of orbit deeper into space. Modify silly putty to make it non-volatile in vacuum and to not break when hit at high velocity. Coat long panels with the stuff and put them in orbit. Tidal force will align the panels radially. Orbital speed will be at the center of mass, thus the upper end of a panel will be moving slightly faster than debris at that height – catch up to and stick to it. At the lower end debris will catch up to and stick to the panel. Could make these as long cylinders, slowly rotating on their long axis so the entire surface will get coated with small debris. When they’re full, pop open a gas bottle on the upper end to push it to a low enough altitude for air drag to deorbit it. That wouldn’t take a lot of push, an astronaut “threw” a large and obsolete piece of equipment from the ISS with enough force to alter its orbit so it’d get dragged down to burn up. NASA has the video online somewhere. Had his feet clamped to one of the platforms on the outside of the station. Got a good grip on it, leaned back then rocked forward with his ankles and finished with pushing with his arms. Buh-bye space junk. A 2 liter plastic bottle pumped with as much air as it could hold in vacuum (instead of the ~14 PSI outside pressure on Earth) should do the deorbiting job well enough. Any other debris the collector grabs on the way down would be a bonus. A gigantic satellite with a shell made of silicone. They could name it “The Blob”. Could still use an alternating magnetic field to ‘push’ space junk, or at least deflect it. How do you plan on doing that from vast distances to objects moving so rapidly though? Just throwing out an idea that is out-of-the-box. The speeds and distances in space boggle my mind. I like the laser ablation idea best. NASA has some fantastic ideas for altering an asteroid’s course. I would shoot for a kevlar net with multiple layers and internal suspension. Damn, finally some of my most loved sci-fi tech is coming to reality! Geckoflex is going to be so great!